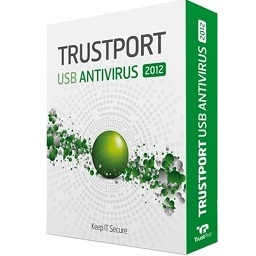 TrustPort USB Antivirus 2012 - a mobile solution for the secure exchange of data on removable storage media like flash drives or memory cards. Prevents the use of malicious code on the storage medium, allows you to encrypt files from unauthorized access. When connected to a particular computer is activated resident protection. This prevents malicious code in the storage environment. You can start checking the USB-devices at any time. If malicious code is detected, the file will be renamed and moved to Quarantine or deleted, depending on your settings. Through regular updates, antivirus detects already known threats. But every day there are millions of new viruses, worms and Trojans. To detect them, the decisions of TrustPort apply advanced technology analysis of the behavior of malicious programs, which determine if the object is (file, document or program) dangerous or not. This feature allows you to store sensitive data in encrypted form on your USB drive or memory card that helps prevent the loss or theft of vashney information. • Updates without the Internet. This allows the use of TrustPort 2012 if there is no access to the Internet. • Now supports mail client THE BAT. • Security settings TrustPort 2012 password. • a prohibition on the use of USB-drives. • Improved work with encrypted disks.